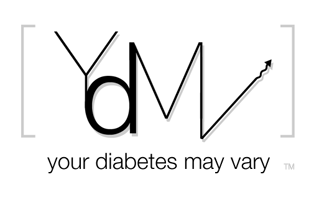 Your Diabetes May Vary: Diabetes Too? I had my every few years annual physical. At my previous annual, three years ago, the good doc said my blood sugar was one-oh-something. He said that was a little high and warrant notice. I had a pretty good laugh. With two type 1 kids one-oh-something is the Promised Land, ground for celebration not notice. I did do some checking at home and my fasting BG was in fact a little high. Here is the deal; I couldn’t be very impressed by the whole thing. I did the A1C and it was 6.0. I had already made some changes and the fasting BG was half way back to normal. They wanted me to see an endo and a nutritionist. Sure, I like I don’t know what they are going to say? I am eating better as much to save money and eat tastier stuff as anything else. I started taking in home made soup or chili instead of buying lunch. I’m a lot better cook than the local sandwich shop so I am getting good eats and as a side benefit I have lost weight. My fasting BG has come back to the 1-0-x range. I’ll keep check my blood from time to time. I’ll be more active. More time on the tread mill less blogging. I am going to skip the endo and the nutritionist. I think it is an act of charity to others who would be in the classes they would refer me to. I would be a frighteningly disruptive influence in an intro to type 2 class. I need to keep making a small effort. I’m still not impresses by the whole thing. It may need doing but it is nothing close what either of my T1 kids does without thinking. There is no way I'll call what I need to do diabetes too. Any fasting over 100 on two separate occassions is considered pre-diabetes, so yeah, cause for notice, but I'm sure you know what to do, and it sure sounds like you're doing everything right. "There is no way I'll call what I need to do diabetes too." "It may need doing but it is nothing close what either of my T1 kids does without thinking." I like that sentence too. I think that your education around managing blood sugar with the kiddos will serve you very well working to manage your own. My father has type 2 diabetes and it really irks me sometimes that we have the "same" disease. Uh, NO.